It was unknown who the woman in this unfinished painting is. Based on the style of this portrait, it might be painted around 1930. 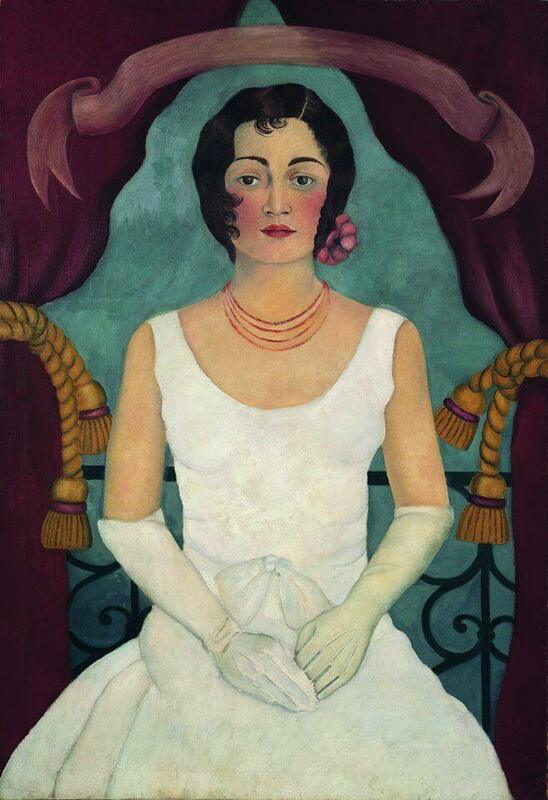 At that time Frida and Diego Rivera were living in San Francisco and Frida painted a few portraits. Most of the protraits are for their friends or wives of Rivera's assistants. This woman cannot be identified might be a member of their circle of acquaintances. Someone also speculate she is a relative of sculptor Ralph Stackpole. The couple was living together with him when they are all at San Francisco. This portrait has very similar content and styles compared to the self portrait named "Time Flies", which Frida painted on 1929. The young woman wears a white dress and posed between a pair of curtains before a balcony window. The subject in this painting conveys a sense of innocence and purity. But no body know why Frida didn't finish this painting. Someone speculated this mysterious girl is Frida's first lesbian lover and before the painting was finished their love affair ended abruptly. Others mentioned this woman is just a casual acquaintance and their friendship finished unexpectedly before she can finish this painting. The banner at the top of this painting is left empty. If something was written there we probably can have more information to explain the mystery of this painting.